We had a light dusting of snow last night and schools are closed today in my county. I’m guessing there are some officials in Atlanta wishing they had made the same decision yesterday before snow and ice paralyzed the city‘s roadways. Although they tried to dismiss school early the traffic was so horrific some buses were unable to get children home and instead had to return them to school. 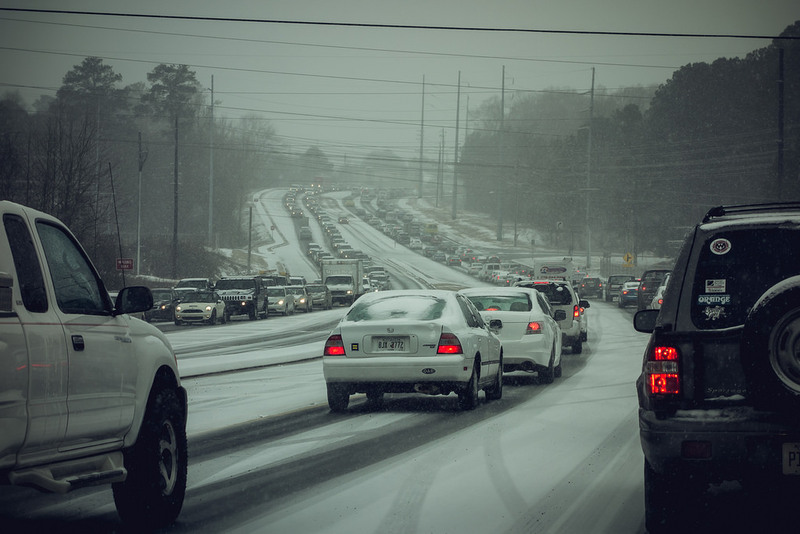 Parents who normally pick up their children were stuck in traffic eerily reminiscent of scenes from the Atlanta-based series The Walking Dead. A shelter-in-place order was issued after 10:00 pm last night and about 452 staff and students spent the night in several different ATL public school buildings. This situation could be any public communicator’s nightmare scenario. 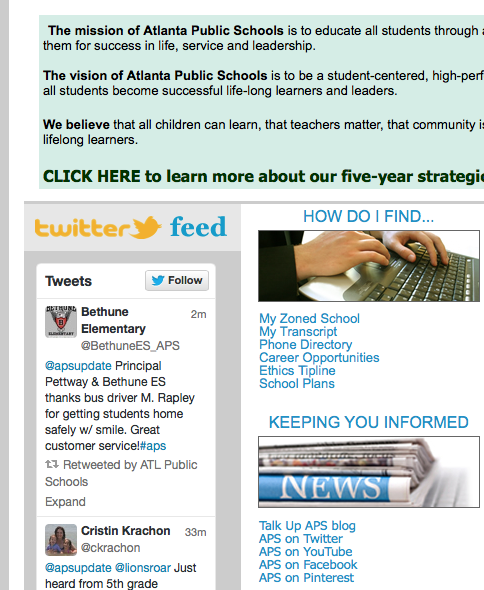 However, the Atlanta Public School’s communications team provided a master class in emergency information dissemination, mainly through their @apsupdate (or Atlanta Public Schools Update) Twitter account. Here are a few things they did well. Reply to @KharaJ1 be sure to reach out to your child's school. All students are allowed to use phones. I have heard quite a few communicators debate whether or not they should address direct questions since it could overwhelm staff and bog down the message they are trying to convey. However, in this situation, the decision to address each person was the only logical choice–ignoring parents’ questions could have been its own disaster. It is a good/best practice to directly address people that are disgruntled or spreading half-true information. The Tweet below demonstrates this tactic. It appears a couple of kids got into a kerfuffle at one of the sheltering schools and were escorted to the office. Once person stated on Twitter “…fights are breaking out!” The Tweet was outlandish and ATL Public School communicators pointed out that not only was the person incorrect, but were needlessly causing concern. When children are kept in school buildings overnight without their parents I’m guessing not a lot of people are getting a good-night’s rest. This was true for the communications team as well. Indeed, the Twitter feed for the district was active all night, for example, at 2:00 a.m. they addressed an upset parent that was concerned about building security. @apsupdate I am getting verifiable on the scene reports that #APD is not providing officers to ALL 'shelter in place' school locations. As the new day began, they addressed a flood of questions and sent out reminders that school was canceled. Yup. They deleted one of my comments which was not irate, no bad language, nothing. I simply called out the truth – they did not take our children, teachers or parents safety into consideration at all. Atlanta Public Schools Dana McElwee Carnahan we rarely, if ever delete posts. We value social media and interaction and maintain a robust FB and Twitter presence. Feel free to post again. Although the decision to incorporate social media posts into their blog and website was done well before the storm, it certainly can pay dividends during a disaster or emergency. Websites are still one of the most popular go-to resources for community members: not everyone engages on social media (shocking, I know). Integration, however, provides an opportunity for non-social media users to read real-time interactions during the height of the event and participate if they are interested. By prominently displaying these feeds it also reminds community members that their social accounts are active. Although the Atlanta Public Schools decision-making process regarding closures will probably be questioned in the months to come, the communications team should be praised for their very hard work during this event (which is still ongoing at time of writing). Not only did they step up during the storm to provide parents and community members with the latest information, they were obviously prepared to do so by having systems and processes in place. That level of advanced planning is truly a lesson worth noting. The Congressional Research Service recently released this 13 page report “Social Media and Disasters: Current Uses, Future Options and Policy Considerations” by Bruce R. Lindsay. I have attached the link to the document below. Thanks to Claire B. Rubin for bringing it to my attention. Although this is true, I don’t think this statement really points out the real potential of the technology. For example, community groups are currently leveraging these networks to manage donations and volunteer efforts in a much more horizontal, collaborative fashion. Tools have been built, for example, that match people’s needs with other’s desire to help. In the process, they essential take government out of the equation. See this post: “Using Social Media to Aid Recovery” which describes how and why platforms such as Rebuild Joplin were created. Essentially, the organizers of the site built it to filled a void. 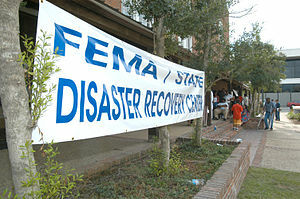 They provided a place for the public to find “trusted resources and dependable information”. It took less than 36 hours for a team of volunteers to build the site, verify information, and announce the launch. Led by volunteers and the crew from SPI Creative, Rebuild Joplin will serve as a model for other communities affected by disasters. The Joplin tool and others like it, including the wiki envisioned by Eric Holdeman in the article “Disaster Wiki: Get Ready Now to Harness the Power of Social Media,” I believe are the future of disaster recovery. Perhaps the author could have asked what the federal government could do to help foster the development of these types of sites and tools before a crisis occurs, versus focusing on just how to use these networks to disseminate information in a unilateral fashion after an event. From personal experience, people will do whatever it takes to keep their cell phones charged. Of course we should always consider alternative ways to get information to people, but we should also discuss mitigation measures, such as the rapid deployment of cell phone charging stations to allow for information to flow in ways most familiar to our populations. This seems to be a lesson learned after each big event. His suggestion that adoption of these tools take place after “further examination is completed” is not really an option. Citizens, community organizations, volunteers and governments are already using social media for emergencies and disasters. Although I would agree that we all still have a lot to learn, I believe, as they say in my native Texas “the horse has already left the barn”. Click this link to see the CRS report. Social_media_9-06-11-1 If you have trouble, the article was also linked here: <http://www.fiercegovernmentit.com/story/crs-warns-social-media-abuse-during-emergency-response/2011-09-13>. Tuscaloosa City Schools turn to Social Media after the storms. Some school districts are finding that social media are great tools to distribute information to stakeholders: parents, staff, students, teachers, and members of the community. Some districts, however, have found that social media are sometimes the only way to communicate, particularly after a crisis. I have written about the experiences of the Joplin School District after a tornado destroyed a large portion of their town, and today I’d like to highlight a similar story from Tuscaloosa, Alabama. 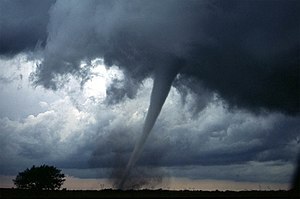 As a bit of background, the April 27th tornadoes that struck in and around Tuscaloosa were part of a tornado outbreak that was one of the deadliest in the history of the United States. The storm destroyed 3 schools in the Tuscaloosa City School District and took out an area of town that housed the servers used to host the District’s website. One staff member, Lesley Bruinton, the District’s Public Relations Coordinator, sheltered in place with her daughter in her home’s bathtub. She received text messages from a friend regarding the storms’ location as well as information confirming that one school had been impacted “It’s gone” he texted. Her first order of business, after she climbed out of the tub, was to figure out how to keep the district’s stakeholders informed. She concluded that there was really only one answer: Facebook. Since they had not been using social media, and therefore had no formal policies in place, they quickly came up with some rules of the road. They assigned 8 people administrator rights and decided that members of the community would be allowed to post to the wall, a conscious decision designed to encourage dialogue and openness. Astonishingly, the school system decided to get the city’s school children back to class only one week after the storm. Enough space and empty classrooms were found to accommodate the children from the three damaged schools, but teachers insisted on having the rooms looking spiffy in order to provide a comfortable environment for the potentially traumatized students. This meant they needed volunteers. People in the community were very willing to assist, but the first Sunday after the storm they found the distribution of volunteers somewhat uneven, leaving one school without anyone slated to help. In order to address this problem, Lesley put up a message on facebook and literally, within 20-30 minutes, almost 80 people showed up. Within one week of opening the page they had 1500 fans. Lesley indicated that she knew from personal experience that people were accessing the information from their smart phones. Even if people’s homes had been damaged and they might not have access to computers–they still had their phones. There was a lot information that had to be conveyed; bus routes were disrupted, of course, and students were moved to new buildings–essentially they accomplished rezoning the school district in a week! The rapid means of communicating through social media helped facilitate the process and also allowed for important questions from the community to be answered in a timely manner. Their facebook page also became an interesting outlet for students. Older students started up a mini-petition right on the page, protesting the quick return to school. I inquired as to why students were allowed to vent on the district’s page, and her attitude was quite refreshing. Essentially, the district didn’t feel that the comments were harmful in any way, so they simply left them there. They did not, however, engage the ranting-students in an argument about the decision for a quick return. Pretty cool, I think. They were more concerned about questions or postings about specific student’s well-being, mindful of privacy concerns. With the app in place they opened a paypal account to accept monetary donations and put a “donate” tab on the page. Don’t limit your staff’s ability to communicate with the public by putting up firewalls. Incorporate redundant systems into your emergency communications plan. Practice like you fight: if you think you might have to use social media in a crisis, then use it in your daily communications. Remember, social media are SOCIAL, they can become a forum to discuss issues, which can be cathartic after a crisis. Social media allow for a fairly easy way to organize donations and volunteer activities. show restraint in online engagement (it’s not going to change opinions, people feel freer to vent online and will say things in that forum that they would never say to a principal or superintendent’s face). post regularly…seldom posting habits lead to dropping out of newsfeeds. I consider this the top of mind thing. Thank you to Lesley for her contribution to this article. We are all thinking about you and your community as you continue on the path to recovery. How Can University Emergency Managers Use Social Media? I recently gave a talk to University Emergency Managers about how they can use social media to enhance their communications with students, particularly during the preparedness and response phases. This presentation is available here: Social Media’s Application for Universities. The great thing about talking to this audience is that they understand that almost 100% of their population is using web-based and/or mobile communications. Therefore, I spend zero time putting up statistics on who is using social media and why it’s important. They get it. So instead, I introduce some concepts and ideas they might not have considered. Universities are adept at using social media for public relations, as an example, Texas A&M’s main facebook page has 200,000+ fans. But when it comes to communicating public safety information the number of fans on those pages (both the emergency management page and the campus police page) drops dramatically. This almost begs the question whether or not this information should be posted to the main site. Some universities have already come to that conclusion, and I think it is probably a good idea. I have also found that quite a bit of emergency preparedness info is still very much stuck in a web 1.0 world. 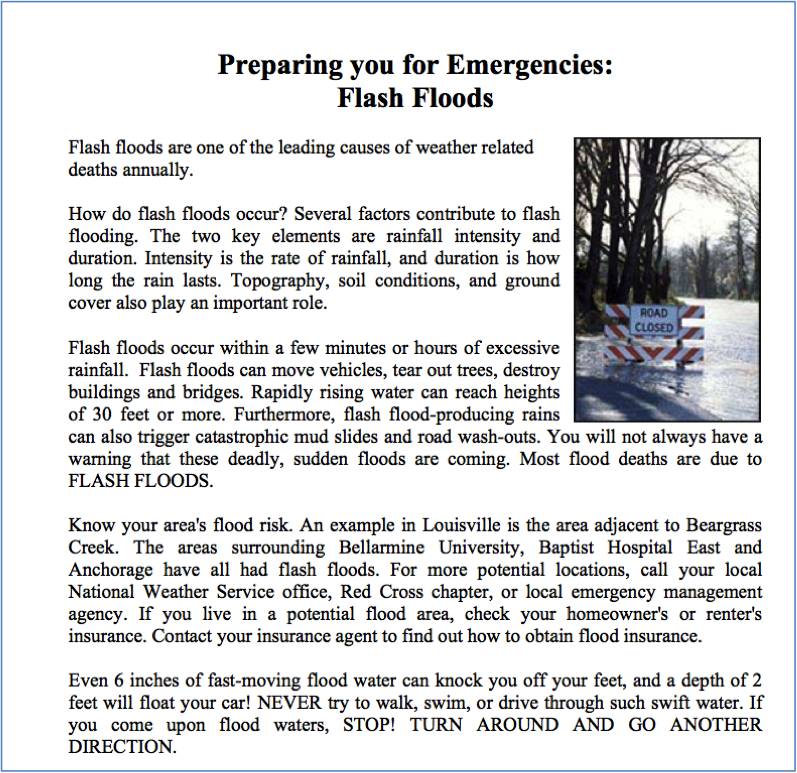 We all have an arsenal of “fact sheets” and quite a few emergency management organizations simply post them to their website. One sheet, not from A&M, described the dangerous localized flooding that occurs almost every year in and around the University. The page implored the kids to “KNOW YOUR FLOOD RISK”. However, I have to wonder how many student ever saw or read that sheet. There are a lot of things competing for students’ attention, to say the least. Hazard identification is probably not at the top of the list–unless of course they are geography students. So, even if information is posted to the most trafficked site, and not in the form of a bland fact sheet, how can we ensure our message gets through, particularly preparedness information that tends to be ignored? 1. Games. One new hot term is “gamification.” It is described as “the process of using game thinking and game mechanics to solve problems and engage users.” In other words, not only making something fun but also challenging and rewarding. The reward does not have to be tangible, in fact, it turns out earning status is more of an incentive than earning a trinket. Some Universities are already using mobile or web-based platforms to engage student with games like SCVNGR, mostly to orient freshman students to campus. The game is a mobile application for iPhone or Android. Others are designing their own scavenger hunts using applications such as Foursquare. 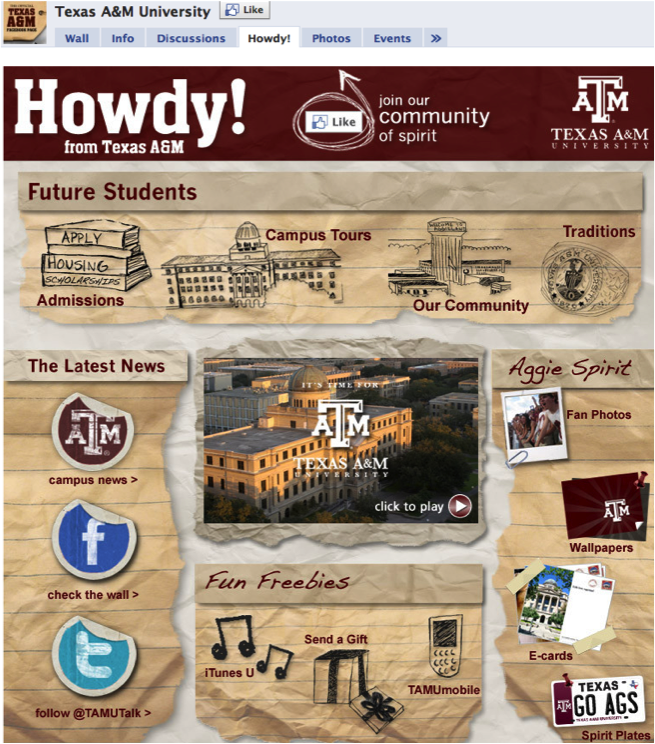 Texas A&M used this app to encourage all of their students to explore the campus (5200 acres) but with the unadvertised motive of boosting the number of student followers to the University’s twitter account. Although this example did not include emergency preparedness information, I have to ask, why not have students find campus safety features such as tornado shelters, fire extinguishers, evacuation routes or even identify hazards, such as the aforementioned flash flood areas? 2. Games or prizes for visitors One issue for campus emergency managers is that there are often huge influxes of visitors to their campuses for special events, particularly sporting events. How can we get information to these folks? Twitter has a handy fast follow feature that’s well known to the #SMEM community but not as well known by others. A University Office of Emergency Management could ask visitors to text from their cell phones to the number 40404 “follow @universityEMA” . This would allow campuses to get all kinds of information into the palm of every visitor. 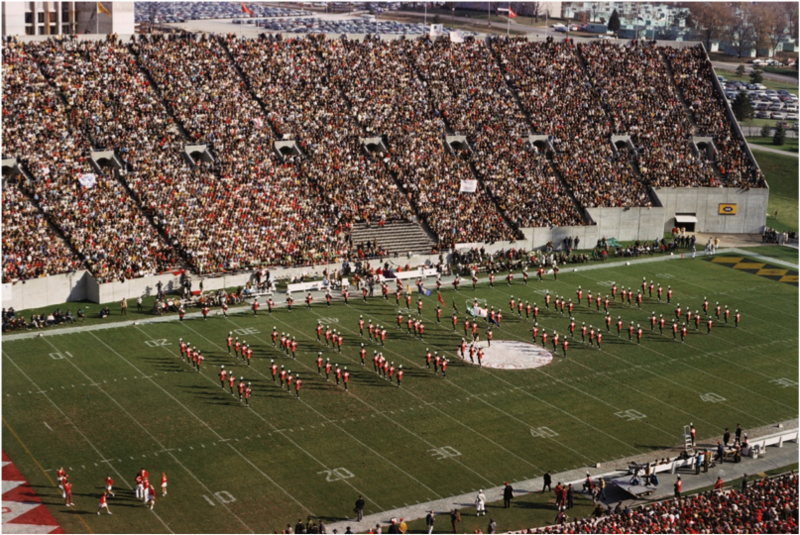 In order to get people to use the feature, a free cola product could be offered at the football game, for example. In order to make people understand the benefit, tweets should have useful info such as what streets on campus are closed to traffic and how to most quickly exit the parking lot. But don’t forget to remind people how to turn the feature off after they leave! 3. Crowdsourcing. Challenges, like the ones the federal government have been designing since early 2009–see challenge.gov, work by asking the public or the “crowd” to submit solutions in order to win a reward, usually a small sum of cash but occasionally just status. Universities are particularly well suited for this type of innovate problem solving because they have 1. a huge talent pool to pull from and 2. class credit and other natural campus incentives to give away (football season passes, etc). The emergency management community should get into the act by creating a challenge designed to find creative ways to get preparedness information to the student body. This is also important because if we try to create something #fun students might see it as #lame. 4. Crowdsourcing after the crisis. Patrick Meier of Ushahidi, I believe, was the first person to coin the term “bound crowdsourcing”. This concept limits the crowd to a smaller group of trusted agents. As an example, monitoring information from social media after a crisis would not have to be a completely open process, but could be limited to this group of trusted sources (e.g. a twitter list of these folks could be constructed) . This is another thing college campuses have in abundance, a plethora of people that are trusted with student safety everyday: graduate assistants, professors, resident advisors and staff. I propose that these people could be trained to send information to emergency services after a crisis via text message or twitter in order to indicate the situation around campus–particularly non-emergency information. SMS text or twitter are important because they tax bandwidth much less than voice. I can envision this working after a crisis where, for example, professors or RAs could text whether or not all of their students are accounted for and provide prelimarly damage assessment information as well. School is starting soon and September is National Preparedness Month. Let’s get creative!